As a homeowner blessed with beautiful outdoor spaces, a mini chainsaw is an essential tool for ongoing garden maintenance. However, with so many options on the market, finding the right solution can feel like navigating a shopping minefield. Handheld chainsaws boast many advantages, including the fact that they can be handled by virtually anybody. Their uses include trimming, pruning, felling small trees, and firewood cutting, making it a very versatile option. Given that they’re much cheaper than the heavy duty alternatives, they are a winning solution for most average homeowners. There are many factors to consider when looking for the best small chainsaw available, and overlooking any of them could lead to a poor decision. We’ve tried out three of the most popular tools on the market to bring you an informative and unbiased guide to aid your consumer decision. GreenWorks Tools prides itself on cutting-edge innovation. In this sense, the 201362 mini chainsaw is one of their leading products. The 10-inch bar and chain, coupled with the weight of just 7.2lbs, makes it a comfortable option for all users. Moreover, the stylish green and black coloring looks fantastic. The crucial question, though, is whether it does the job. In short: as long as you’re planning to use the 201362 for small jobs around the yard, it works fine. Realistically, it will struggle to cut anything thicker than 8”. However, the speed that it cuts through small branches is very pleasing. While it’s not the cheapest cordless chainsaw on the market, it’s durability and long lifespan ensure good value for money. Moreover, the maintenance during use is particularly easy thanks largely to the self-oiling factor. Likewise, a translucent oil gauge makes it easy to see when the oil needs topping up. Having said that, some may argue that the consumption is a little quicker than ideal. Meanwhile, it’s worth noting that the oil can make things a little messy. Still, this is one of the best alternatives to gas-powered chainsaws and can cater for most small garden jobs. Its versatility is certainly a winner too. 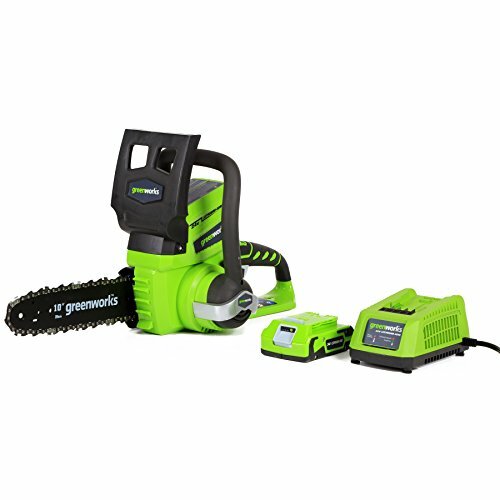 The GreenWorks 10-inch cordless chainsaw is a popular option. Using it is as easy as pressing the start button and cutting away while it’s battery life caters to most general backyard chores. As an accessible mini chainsaw that can be used by almost anyone, it’s positives easily outweigh the negatives. 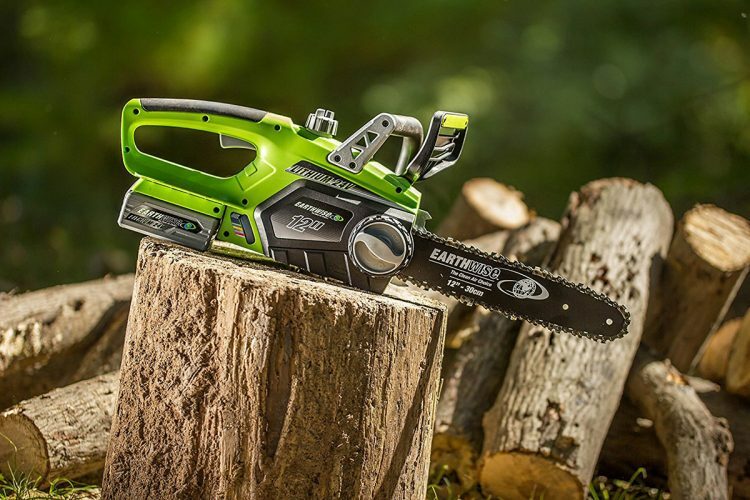 The Earthwise cordless mini chainsaw uses a 10-inch Oregon bar and chain, weighing in at just 7.2 pounds. Aside from its lightness, it also boats quick charge systems and automatic oiling for a very user-friendly experience. Unfortunately, though, its comfort and accessibility do come at a cost. It is a fairly flimsy mini chainsaw that struggles with any tough tasks. Nobody would expect an electric saw to match the durability or capabilities of a gas-powered chainsaw. Nevertheless, the results of this one are a little disappointing. The speed of cutting becomes fairly slow once you hit the 4” mark. In truth, this tool is best suited to branches with a thickness under 2”. When using the LCS32010, we found that a tight grip was necessary for a smooth cut too. Thankfully, the positioning of the trigger makes it a comfortable handheld solution. This makes it a perfectly fine option for minimal backyard work, especially if done infrequently. However, a short battery life can leave you frustrated, even if you won’t need to wait any longer than an hour for it to recharge. It can be improved with new chains and an array of accessories, but that will significantly bump up the price. The Earthwise chainsaw does serve a purpose, but that purpose is fairly limited. 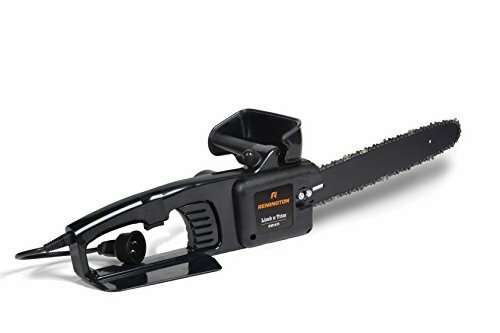 It’s certainly not the worst mini chainsaw on the market. But if there’s even the slightest possibility that your backyard jobs won’t be exclusive to trimming, there are better options on the market. The compact Remington RM1425 is one of the lightest on the market, weighing in at just 6.2 pounds. It is designed to be an accessible option that anyone can use. It certainly lives up to the billing for those wanting a quick and easy solution for simple backyard maintenance. As one of the cheapest solutions, you may not expect much from the RM1425. However, the 14-inch chain is more than capable of cutting through smaller trees and hedges. The chain will become loose if you try too much, and tightening it can be a little more difficult than some of the other options on the market. Meanwhile, the lack of an automatic oiler means you’ll have to keep an eye on things although oiling is as easy as pushing a button. The machine is particularly responsive too, stopping as soon as your finger leaves the trigger. While this can cause some issues with resuming work on thicker trees, it ensures an immense degree of safety. Ultimately, as long as you aren’t expecting miracles, this beefy handheld chainsaw will keep you smiling. Furthermore, it’s impressive durability promotes an even greater value of money. Better still, it removes the need for expensive and time-consuming maintenance. While the Remington isn’t perfect, there’s a lot to like about it. From the fact it comes ready assembled to the use of a low-kickback bar, the light and easy-to-use tool is a good one. The leaking oil when not in use is a small price to pay for those positives. Which mini chainsaw should you choose? First and foremost, we’d advise against the Earthwise option. While it isn’t a bad mini chainsaw, it almost falls victim to becoming the Jack of all trades and master of none. The Greenworks is certainly a good option, and its performance wins out over the other two options. It’s comfortable, stylish, and capable of handling work up to 8” in thickness with minimal fuss. Ultimately, it will take care of all small maintenance needs. For most homeowners, though, cutting branches and regular trimming is all that’s needed. The Remington can handle those jobs. While it doesn’t boast some of the advanced features, it’s easy-to-use nature coupled with its low weight makes it perfect for people of all ages. Our winner is the Remington for value, especially when your backyard maintenance is minimal. Besides, a big workload will need a gas-powered chainsaw regardless. For most homeowners, an RM1425 is the only handheld chainsaw you’ll need. The fact that’ll save you money in the process is a bonus.